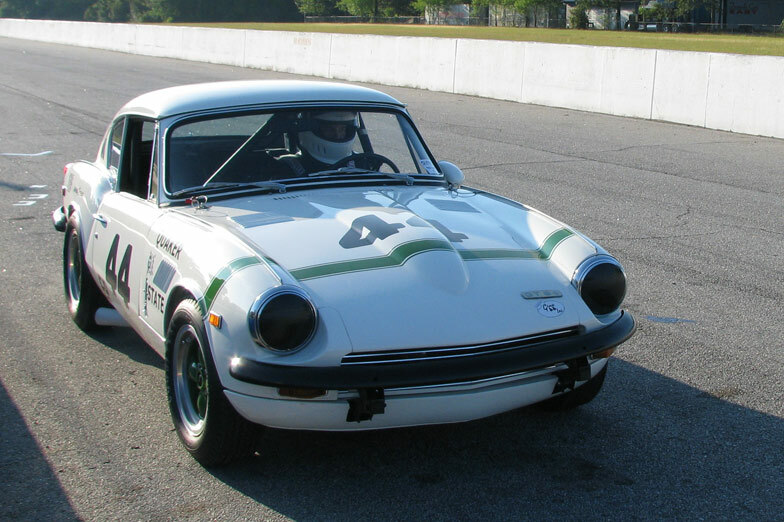 Our Group 44 Inc. GT6+ hits the track for the first time since the mid-'70s. Brian Rechtiene of Vintage Racing Services adjusts for a little more rear brake bias after our first session. We loaded up the motor home with every tool, fastener and spare part we could think off, filled the GT6+ with 114-octane fuel, and headed north to enjoy some SVRA hospitality. April 16th dawned cool and beautiful—the exact weather you would want when testing out a new race car. With lows in the 50s and highs in the 70s, Roebling Road was going to be the perfect place for our Group 44 Inc. GT6+ project car to turn a wheel in anger for the first time in more than 30 years. We loaded up the motor home with every tool, fastener and spare part we could think off, filled the GT6+ with 114-octane fuel, and headed north to enjoy some SVRA hospitality. Our crew consisted of Tim Suddard, Gary Hunter, fellow Triumph club member Jere Dotten, and expert sorter Brian Rechtiene of Vintage Racing Services. We figured having an expert on hand would be just the trick to a smooth test day. 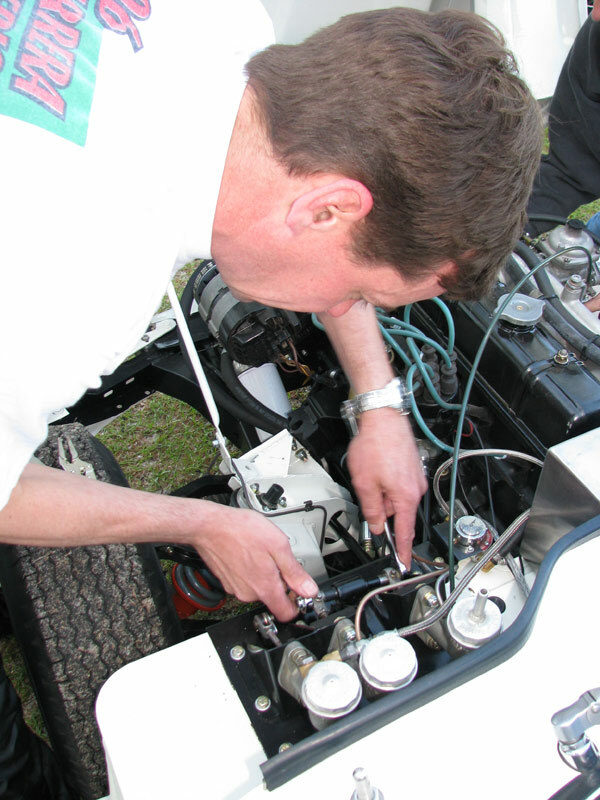 Since Vintage Racing Services built the drivetrain and has become one of the the Northeast’s best and brightest vintage race car prep and restoration shops, we thought it best to have Brian looking over our shoulder. He arrived bright and early and proved to be very efficient, friendly, well prepared and a consummate professional. After a careful inspection of our handiwork, Brian took the car for a couple of slow laps at the back of the grid. He then came in and complained of having no power at the top end. A quick fuel-pressure and float-level adjustment solved the problem, and Brian once again hit the track. The second session was going great, but then the oil temperature raised unexpectedly. This was a shame, as Brian was starting to love the car. 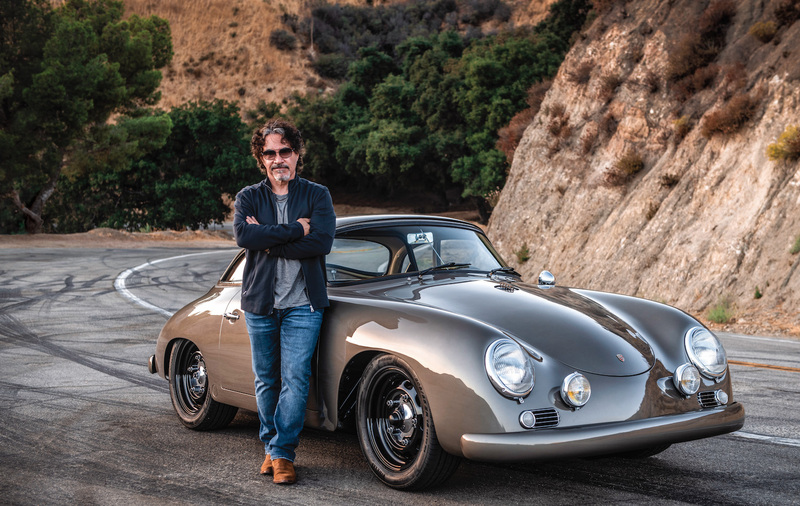 Aside from the issue, he reported that overall the car was a joy to drive—the brakes were great, and the handling, while not finalized, was rock solid. Upon closer inspection, it became obvious that once the engine reached full rpm, the oil cooler and filter were not getting hot. We went through line by line looking for blockage. An inspection of the oil filter adapter built by Brian Furstenau of Group 44 indicated that we had doubled up the oil filter O-ring, thus prohibiting the oil filter adapter from sealing properly. This allowed the engine to pump the oil right back into itself, so we weren’t cooling or filtering the oil. Although a simple mistake and an easy one to correct, the damage had been done. During our next track session, we lost oil pressure and quickly pulled into the pits. We cut apart the oil filter and found metal-bearing material. Our test day was done. We headed back home to pull the engine. On the plus side, our crew worked very well and we would highly recommend Vintage Racing Services to all of our readers, especially those who own smaller bore British cars. We also cured all of the initial teething problems, and the car was fun to drive—not evil at all. Of course, on the negative side, we had damaged our beautiful fresh engine and had precious little time to fix it before The Mitty. Don’t worry, as the car will be on display at The Mitty, even if it contains the engine from the parts car. It's amazing how a small oversight committed months ago jumps up and bites you in the heinie in such a huge way. Customers complain about how long it takes me to finish an engine. This is why. Everything must be triple-checked before moving on because the aftermath of a mistake can be devastating. Hard to do on a project with a magazine deadline, though. Despite my overwrought obsessiveness, I once overlooked a small "worm hole" in a combustion chamber of a Triumph Dolomite-based SAAB engine (on a cylinder head my machinist swore he pressure-checked). The result was a cylinder full of water which came close to hydro-locking the engine and bending some parts. Another cylinder head and draining the fluids finally put my car on the road. That engine lasted a good long time for a British-derived product (>88K miles until a valve head decided it had enough and separated from its stem). I'm sure this setback will be equally as temporary. No matter how good you are, something like this will happen if you're in the game long enough. If you're lucky, you haven't wiped out a cam lobe, the crank will only need a polish, the bearings get replaced and a new oil pump sourced with a new pump drive as well. I look forward to reading about this car clawing its way around Laguna Seca and other historic tracks in the future.